Nature and industry play a large role in Wayne Vaughn’s work. You can see the elements shine through clearly in “Fermata” with the steel and patina. Vaughn strives to bring animation, balance, and intrigue to his work. He plays with the effects of gravity but still maintains a certain trust between the piece and the surrounding landscape. 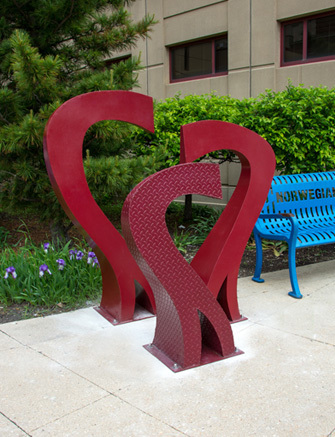 Two of Vaughn’s passions converge in fermata, music and sculpture. In music, a Fermata is a pause of unspecified length on a note or rest. 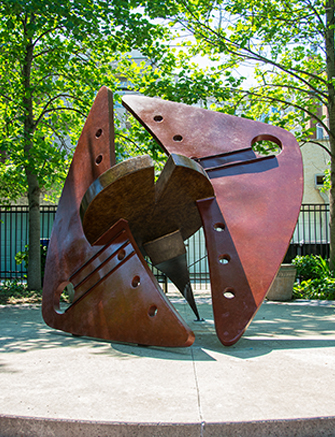 Vaughn hopes that the viewer will take time to pause in front of this sculpture and connect with it.